Markets continued its up surge in Fridays trading session as well but despite gaining nearly 190-odd points from the previous two sessions, the benchmark NIFTY50 ended the week flat. The NIFTY ended the week gaining 8.75 points or 0.08% on weekly basis. The week that has gone by has remained quite volatile to say the least as the Index saw itself swinging back and forth in a wide range with volatility accompanying it. As we step into the coming week, we will also face expiry of the current derivative series. Speaking on broad terms, with the NIFTY forming a lower top after 11100 levels at 10930, we still rule below this area. There are all likelihood of volatility refusing to go away and we will see the Markets trading in a bit wider range with good amount of volatility ingrained in the sessions to come. 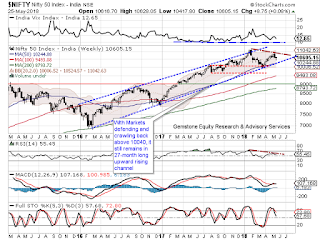 The resistances for the coming week are expected to come in at 10735 and 10850. Supports are expected to come in at 10485 and 10390 zones. The Relative Strength Index – RSI on the Weekly Chart is 55.45 and it remains neutral showing no divergence against the price. Daily MACD stays bullish while trading above its signal line. On the Candles, a Candle with long lower shadow occurred. Since this holds importance only when it occurs during an downtrend, it has no significance in the present context. While having a look at pattern analysis, NIFTY continues to remain in the 27-month long upward rising channel and also the Moving Averages remain in order with each smaller one trading above the larger. It remains to be noted that with the RSI remaining neutral, it too has formed a lower top for itself as evident from the Charts. 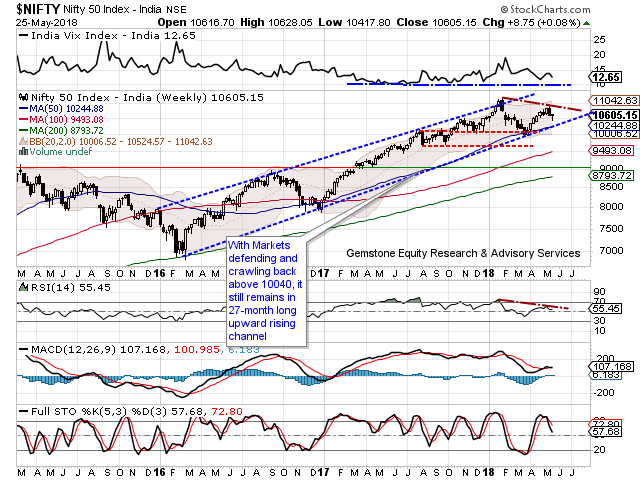 Overall, in any given scenario wherein the NIFTY might see the continuation of the pullback, the upsides are likely to remain capped from now on in the 10800-10875 mark. Once the NIFTY approaches these levels we will have to deal with that formation with great amount of caution. We expect NIFTY might continue to move up but at the same time might encounter profit taking at higher levels as well. We now recommend protecting positions at each higher level. The coming week and weeks after that will give rewards much on the basis of effective stock selection and sector rotation that will be done. 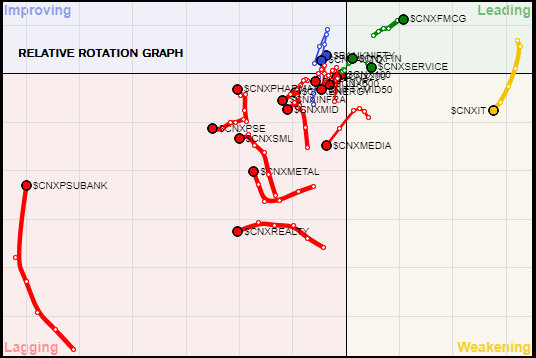 A study of Relative Rotation Graphs – shows that in the coming week, the Financial Services pack along with FMCG is set to relatively outperform the Markets. Though IT Pack did see some moves, it has continued to steadily lose momentum and is likely to continue to slow down and lose the momentum. Along with this, we will see some relative improvement in momentum in BANKNIFTY pack. 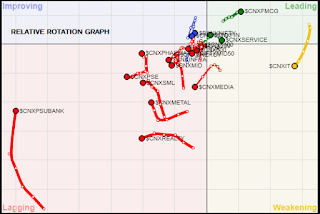 We are also likely to see METALS and PSU BANKS continuing with their trajectory to improve in relative momentum. We do not see any notable performance coming from REALTY, INFRA, AUTO, and other broader indices. These sectors will see only stock specific performances only.